Despite substantial FX market moves over the past month, the ranking of currencies on this framework has hardly changed. 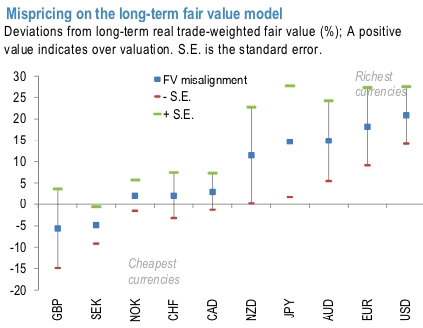 GBP and SEK remain cheap, while USD, EUR, and the Antipodeans remain at the rich end of the spectrum (refer 1stchart). Crude prices are inching down today (at around $51.60), to pare yesterday’s strong gains. Over the past month, JPY, SEK, and GBP have outperformed within G10, while the Antipodeans have underperformed the most. AUD continued to trade on the back foot, breaking resuming bearish sentiment at 0.7212, currently trading as low as 0.7173 before spongy gains to 0.7210 as the yuan eased. NZD has slid back from 0.6848 to the current 0.6771 levels. Despite these moves, GBP and SEK remain cheap on this framework. The dollar has weakened over the past month but still screens rich overall. JPY which was already rich to begin continues to screen rich on this framework. Among the underperformers, Antipodeans are still on the richer end of the spectrum, as is JPY. Given the recent Antipodean underperformance, the overshoot of these currencies on this framework has declined. However, despite this move, these two currencies continue to be the richer relative to the G10 petro-FX (refer 2ndchart). Currency Strength Index: FxWirePro's hourly AUD spot index is at -52 (bearish), GBP spot index is inching towards 33 levels (which is mildly bullish), hourly USD spot index trending at 64 (bullish) and NZD is at -113 (bearish) at press time (14:03 GMT).